SEC. XLI. 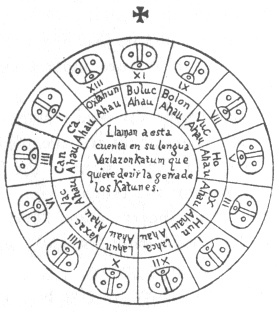 CYCLE OF THE MAYAS. THEIR WRITINGS. not even all the priests knew the whole. The way they had for counting their affairs by this count, was that they had in the temple two idols dedicated to two of these characters. To the first, beginning the count with the cross above the circular design, they offered worship, with services and sacrifices to secure freedom from ills during the twenty years; but after ten years of the first twenty had passed, they did no more than burn incense and do it reverence. When the twenty years of the first had passed, they began to follow the fates of the second, making their sacrifices; and then having taken away that first idol, they set up another for veneration during the next ten years. Verbi gratia. The Indians say that the Spaniards finally reached the city of Merida in the year of Our Lord's birth 1541, which was exactly at the first year of the era of Buluc (11) Ahau, which is in that block where the cross stands; also that they arrived in the month Pop, which is the first month of their year. If the Spaniards had not arrived, they would have worshipped the image of Buluc Ahau until the year 51, that is for ten years, and then would have set up another idol for Bolon (9) Ahau up to the year 61, when they would remove it from the temple and replace it with the idol for Vuc Ahau, then following the predictions of Bolon Ahau for another ten years, thus doing with all in their turn. Thus they venerated each katun for twenty years, and during ten years they governed themselves by their superstitions and deceits, all of which were so many and such as to hold in error these simple people, that one would have to marvel over it who did not know the things of Nature and the experience the devil possesses in dealing with them. 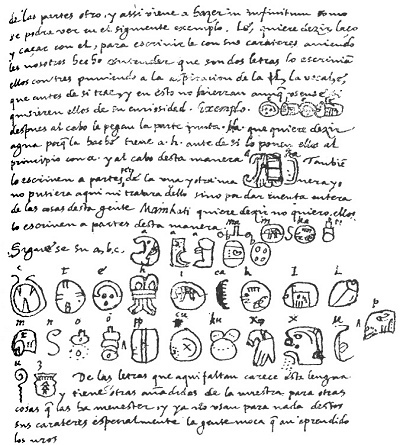 These people also used certain characters or letters, with which they wrote in their books about the antiquities and their sciences; with these, and with figures, and certain signs in the figures, they understood their matters, made them known, and taught them. We found a great number of books in these letters, and since they contained nothing but superstitions and falsehoods of the devil we burned them all, which they took most grievously, and which gave them great pain. The letters that do not appear are wanting in this language; and they have others in addition to ours, for other things where they are needed. But they no longer use any of the characters, especially the young people who have learned ours.